libed2k library(C++ ED2K protocol library) has been ported to Android platform. Free client bases on this library in Google Play: https://play.google....kfsoft.qDonkey. please fix the link, separe "https://play.google.com/store/apps/details?id=org.dkfsoft.qDonkey" from "." Yes, now servers list are hardcoded. Later user will be able to add servers, open met files and so on. For money without advertisement and limits as usual. Android Mule for money? No thanks. 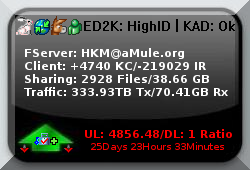 Hardcoded servers, no kad etc are coding stuff that would be fix, but to ask money for *Mule in against the spirit of all the *Mule community. The idea of an Mule client on android is nice, an old phone or tablet kept at home with a big SD memory would be an efficient, power saver and handy Mule station that could be easy connect by bluetooth, wifi etc to other Media devices. Free version based on opensource code. KAD supported. Now it is Very very interesting! I have just downloaded it and during the weekend I'll start the tests! Is this project standalone client for android where when you connect to servers and download contents its on the device or is it remoteGUI which is connected to ~mule deployed elsewhere? This is standalone client for Android. Not remote controller. When are you going to finish the kad implementaion, i.e. add the missing anouncement and budy features? Also is the android app opensource? Or only the lib? I need this play store for my andorid, is posible ? Truth be told I'm not going implement announcement feature because on mobile clients upload files is rare event. About find buddy - I think about it(most mobile clients have unrechable incoming port), but now I'm focused on Java implementation of libed2k jed2k. libed2k, my for for Travis CI libed2k. Android code and desktop application code are open source qDonkey, but desktop application hasn't support KAD page and servers page - it is for my personal usage in local isp(no need KAD and internet servers). Yes, for free Mule for Android you need that services, for non-free version you no need services.